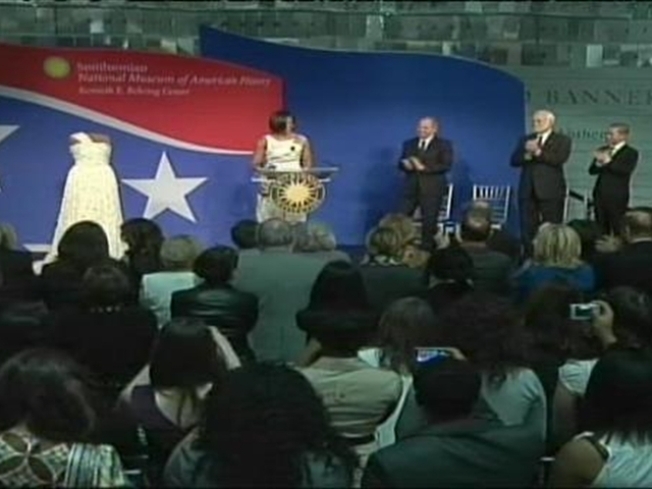 The flowing one-shoulder floor-length gown Michelle Obama wore to the 2009 inaugural balls is now in an ongoing display for all to see at the Smithsonian's National Museum of American History. 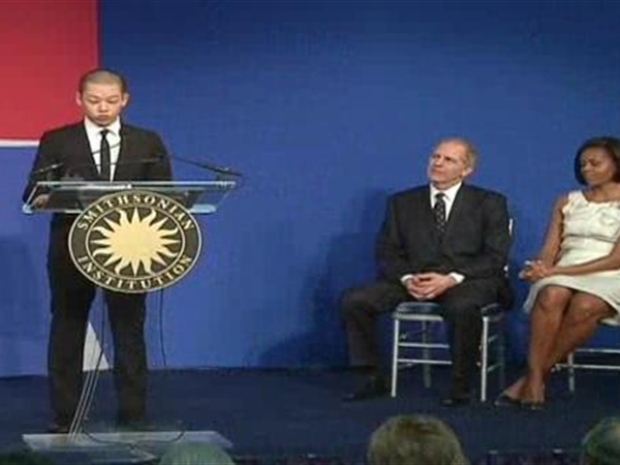 Michelle Obama and the designer, Jason Wu, presented it to the museum Tuesday. The first lady also invited students and teachers from Huntington High School in New York. She described the contribution to the museum as privilege, although she did have just a few reservations. "To be honest, I am very honored and very humbled, but I have to say I am also a little embarrassed over all the fuss made over my dress. Like many of you, I am not used to people wanting to put things I've worn on display," laughed the first lady. The gown will now be eyed by anyone who visits the museum's newest gallery -- "A First Lady's Debut." It includes 11 gowns worn by first ladies from Marnie Eisenhower to Michelle Obama, according to the museum. "This gown and all of the items that we will see in this wonderful exhibit helps us connect with a moment in history in a real way." 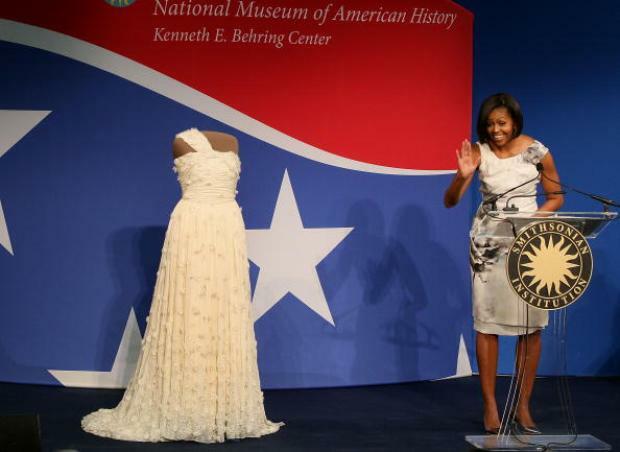 Michelle Obama gives her inaugural ball gown to the Smithsonian's first ladies exhibit. In total, the exhibit will feature a total of 24 dresses, portraits, White House china and personal possessions of several first ladies. "When we look at the gown that Jackie Kennedy wore 50 years ago or the one that Mary Todd Lincoln wore 100 years before that, it really takes us beyond the history books and the photographs and helps us understand that history is made by real life people," said Obama. Obama's dress was widely considered unique. The dress was custom made by a then 26-year-old Wu. "To say that she has changed my life is truly an understatement," Wu said at the event. The Taiwan-born designer is relatively young in the fashion industry, having launched his line in 2006. "There is no doubt that designing the first lady's inaugural gown has been the single most personal and professional accomplishment in my life so far … what an honor," he said. The gallery is an addition to the museum's original exhibition -- "First Ladies at the Smithsonian." The first ladies' collection has been one of the most popular attractions at the Smithsonian Institution for more than a century, according to the museum. The museum plans on expanding the collection in a few years.